Below, you will find a curated collection of some of the best shortwave radio resources on the Internet. Each one of these curtain antennas at The VOA's Edward R. Murrow Transmission Station, near Greenville, North Carolina, are approximately 300 feet (91.5 Meters) high and 240 feet (73 meters) wide. 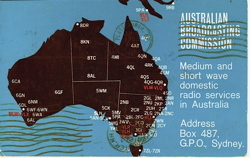 QSL from the Australian Broadcasting Commission. Courtesy of Joseph Terwilliger. ShortwaveSchedule.com - My favorite online source of shortwave broadcasts. Clean, easy interface to find listings by the hour. Prime Time Shortwave - This site has an extensive listing of English shortwave broadcasts in easy-to-print text listings. Eike Bierwirth - This website is useful because it contains full, comprehensive, SW broadcast listings in downloadable formats. When I go to this site, I either download the schedules as a PDF of Word document. The site design is a bit distracting and you may find that the text listings come out garbled. This site is mostly in German, but is quite easy to find frequency guides. DXing.com - This page (sponsored by Universal Radio) has the most comprehensive listing of shortwave bands. Frequency ranges are given for each band increment. They also list what content you can expect to find and best times to listen. Monitoring Times Hot 1000 HF Frequencies - This list, maintained by Larry Van Horn (N5FPW) of The Monitoring Times, is my favorite frequency guide for military, aviation, government and other utility stations on the SW bands. Note that you will need a radio with Single Sideband capabilities as almost all of these stations broadcast in SSB. The DX Zone - This is a very comprehensive site with thousands of links. This link, though, takes you directly to their shorwave section. Glenn Hauser's World Of Radio - World of Radio shows are informative and highlight all of the current activity and news reported on the SW bands. Any DXer worth their salt tunes in every week to hear his shows. For those of you who don't have a radio yet, World of Radio is also available in mp3 form to download and listen to at your leisure. Also, full text versions of his shows are available here. What are Spy Number Stations? - Wikipedia has a nice, concise overview of Spy Numbers Stations. Read this to better understand the history of Spy Numbers. Black Cat Systems' Spy Numbers Portal - This website is the best resource for Spy Numbers on the Internet. They have links to forums where users post real-time locations of Spy Number Stations. Spy Numbers in the Media - There have been several articles written in the past few years that have brought Spy Numbers to the popular press. Follow these links to articles in Esquire, Salon.com and Wired. American Forces Radio Network - The AFRN broadcasts news, information and entertainment programming to military and government workers across the globe. Though much of their TV and Radio programming has gone to satellite, the AFRN still broadcasts on shortwave. Their programming, though US-centric, has quite a bit of variety including networks like ABC, CNN, AP and even NPR. Check out their schedule, then find the best frequency for your location and time of day. You'll need to use the single side-band function on your radio in order to hear AFRN broadcasts. Don't be discouraged if you have trouble hearing the AFRN on your portable radio--try listening at different times on different frequencies. Keep in mind that the AFRN's broadcasts are targeted for professional, military-grade shortwave receivers. Wikipedia - This is the Wikipedia entry for shortwave radio. It briefly touches on many aspects of shortwave listening. On The Shortwaves - This is my favorite SW nostalgia site. It is loaded with interesting articles and links. Nice site design, too! The The SWLing Post (our blog) is updated daily and covers the full array of shortwave radio, international broadcasting, and ham radio. We have over 7,000 daily readers and dozens of guest contributors. Glenn Hauser's World Of Radio - World of Radio shows are informative and highlight all of the current activity and news reported on the SW bands. If you listen to his show and seek some of the interesting stations and broadcasts he mentions, you will become addicted to SWLing, I promise you that. This show keeps its finger on the pulse of shortwave radio better than any other. The WOR broadcast schedule highlights where and when you can find shows with your radio. For those of you who don't have a radio yet, World of Radio is also available in mp3 form to download and listen to at your leisure. Also, full text versions of his shows are available here. Ears To Our World - a shortwave radio distribution project for classrooms in the developing world. RadioReference.com - is a wiki-based site with lots of radio information and links. They also cater to scanner enthusiasts with comprehensive frequency listings based on geographic region. They have a subscription based service, though much of their info is free. Hong Kong Radioer - this site is maintained by a radio enthusiast in Hong Kong. He has a lot of reviews (though some may need translation--he provides a link) and includes many cool obscure rigs. Phil's old Radios - an excellent resource for anyone wishing to purchase an antique radio or simply learn more about one they currently own. Phil's Radio Beginner articles are simply the best vintage radio resources on the internet. NASWA - The North American Shortwave Association has been active in the business of sharing information about shortwave radio since 1961. They focus on domestic and international broadcasts on shortwave frequencies between 2 and 30 MHz. Their SW Listening Guide is my favorite online. They also sponsor the popular yearly Winter SWL Fest, where monitoring hobbyists of all stripes, from DC to daylight, gather for a weekend of cameraderie and talk about radio. Their club motto is “Unity and Friendship.” Can't beat that! LWCA - Want to check out frequencies a little lower down? The Longwave Club of America was organized in January, 1974 to promote monitoring and experimentation on frequencies below the AM broadcast band. ACE - The Association of Clandestine Radio Enthusiasts (The A*C*E) is an association of individuals who find pirate, clandestine, covert, and micro'casting communications. The primary existence of the Club revolves around the publication of a monthly newsletter called The monthly A*C*E. The newsletter reports on the activities of pirate, clandestine, covert, micro'casting, and other unexplained broadcasts. Readers are also provided with other available materials concerning motives, explanations, and theories behind these various broadcasts and broadcasters. With a good shortwave radio, you can hear many of these broadcasts. The Spectrum Monitor - Launched in 2014, The Spectrum Monitor is a full-spectrum monthly digital magazine for the radio listener--covering scanning, shortwave, ham radio and many other radio topics. Turning on a radio and tuning in the world is not only educational, it's fun and easy. SWLing has been a catalyst for many professional careers in international fields, such as journalism, social sciences, and diplomacy. When your children listen to shortwave and are exposed to languages, stories, music and news from around the world, it sparks their imaginations like no other medium. SWLing is inexpensive, and--despite this online guide--ultimately doesn't require that you own a computer, have internet service, nor does it require monthly subscription fees of any sort. It is, perhaps, one of today's most cost-effective educational tools you can get for your family. So are you ready? All you need to do is obtain a good shortwave radio and read this complete, concise, and free shortwave guide.